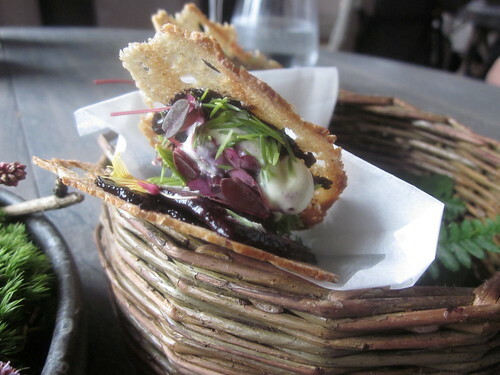 The grazing maw of food snobs has over the past several years reached pastoral Denmark. 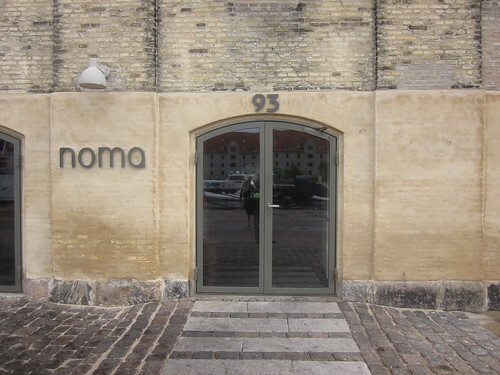 Those who treasure lists note that the “we’re number one” restaurant has been Noma, even prior to the closure of perennial favorite, El Bulli. 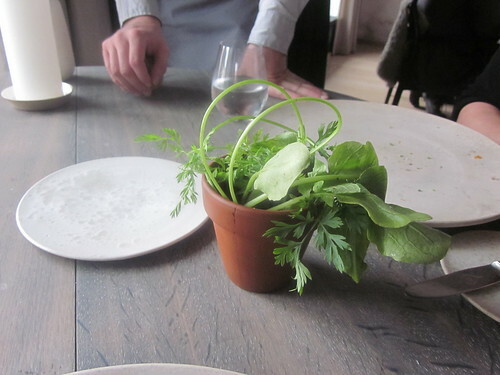 And number 49 is Noma’s cross-town rival Geranium. The two restaurants stand in contrast with Bulli, recognizing commonalities. Within the restaurant biz there are three components of greatness: technique, ingredients, and vision. 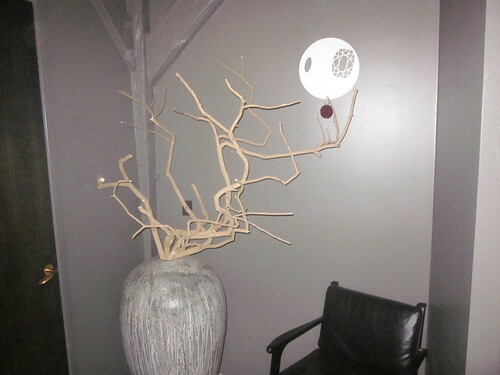 All astonishing restaurants do well on these three dimensions, of course, and vision is primary. But beyond creativity some styles of cuisine emphasize technique and others emphasize ingredients. Not short in its technique, Noma treasures ingredients. 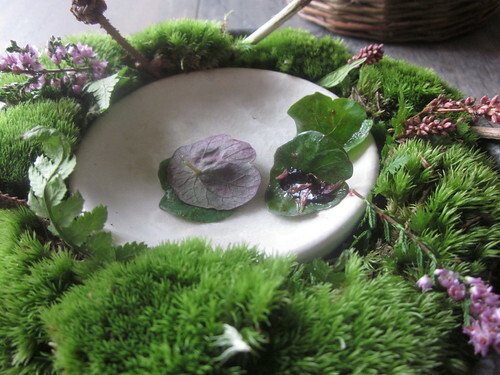 The more humble the plant, the better Rene Redzepi likes it. Weeds are us. But those who live by ingredients, especially novel ones, can also die by them. I am not referring to toxic plants, although – god knows! – these foodstuffs do not have a long-track record. Noma customers have not been known to keel over, but who can say what we will face in twenty years. But the more relevant issue for gourmets is whether the taste of the ingredient can equal the idea of having gathered it. The danger with farm-to-table restaurants is that the food from a treasured family or boutique farm may taste no better than an industrial product if a critic was forced to taste while blindfolded. Often precisely the same ingredients are served – chicken, potatoes, carrots, lettuce. Close one’s eyes and can one tell what is what? 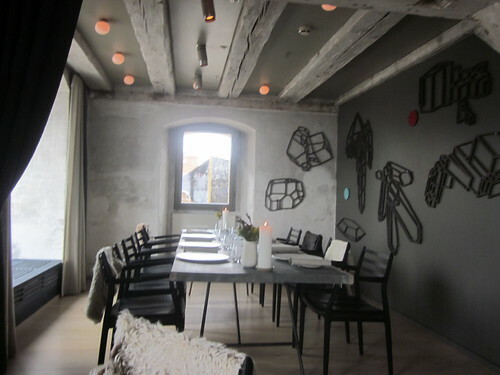 But food in New Nordic Cuisine – gatherer’s cuisine – does not have the safety net of being no worse; it can be worse. Bleech! 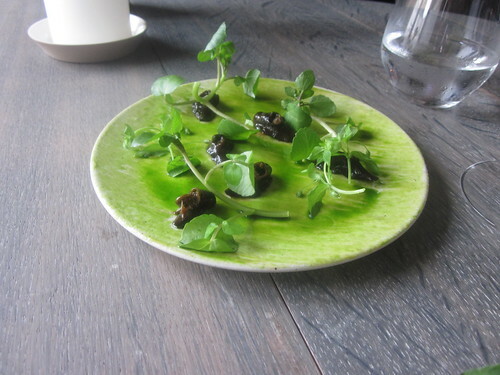 Noma with its food lab and guiding vision of Chef-Proprietor Redzepi and his Head Chef Matt Orlando have only rare missteps, but one can only fear for when other, less insightful visionaries follow in their footsteps. As with the followers of chefs devoted to technique, such as El Bulli’s Ferran Adria, there is much that can go wrong. 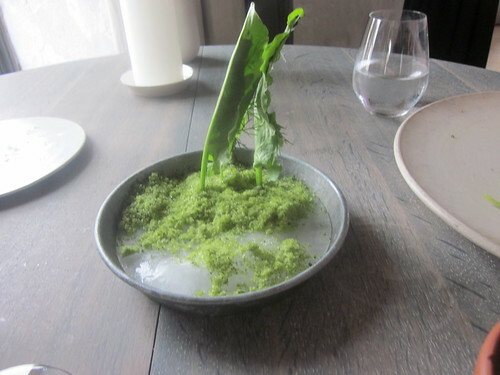 The great restaurants – and however we rank restaurants – Noma is a grand one, are able to combine ingredients, technique, and vision, and they have the customer support to permit them to do so. 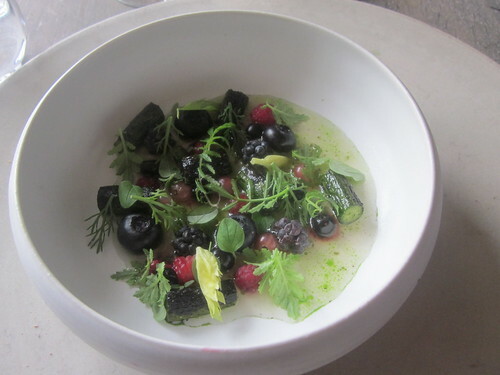 As I was chowing down on sorrel, wild berries, beach herbs, snails, and Danish ants, I mused about food costs. The restaurant employs a troupe of gatherers. Yes, they are paid, but do their finds suggest that there is such a thing as a free lunch? But enough theory. How was the food? It was about as delicious as it could possibly be, considering. 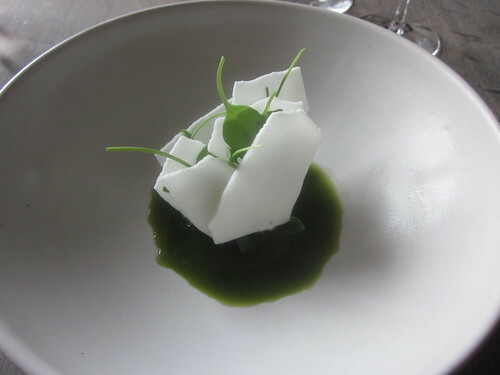 In this essay I do not provide a dish by dish rundown (the pictures provide a part of the story), however, the food was very green, very herbal. The flavors were subtle, often surprising, even as they often lacked the savory punch found in more standard ingredients. Despite the sense that a gatherer’s cuisine has the whole world from which to select, it also gives up on a variety of more conventional flavors. Still, this limited register provides surprises and pleasures. 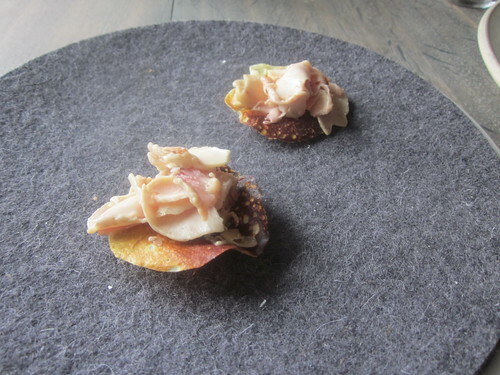 No beef (only sweetbreads), no pork (only skin), no duck (only liver). Proteins are pushed to the side in a grazing diet. Still a smart chef can accomplish much with knives and roasting pans hidden from view. 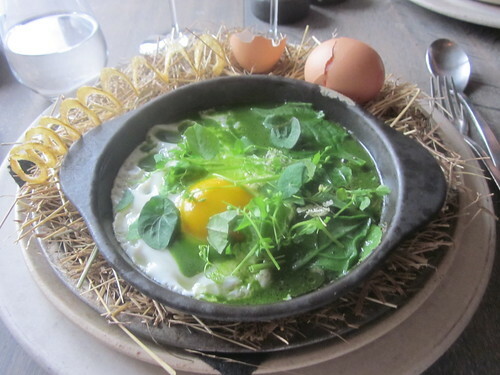 Dried carrots, verbena, egg yolks, rocket, caramelized milk can be inspiring. 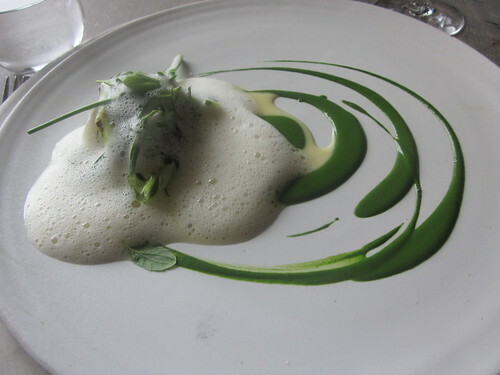 Of the dishes, my favorites, the ones that I remember with the greatest fondness were the moss with mushroom powder; the cheese biscuit with rocket and parsley stems; the berries and cucumber; the brown crab with egg yolk and herbs; and the pike perch with cabbage, verbena and dill. 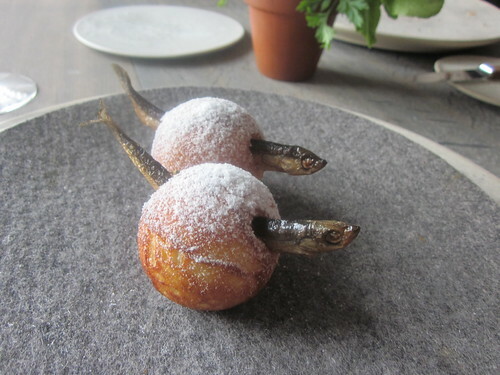 Culinary modesty becomes Noma. But what was most impressive was the vision thing. 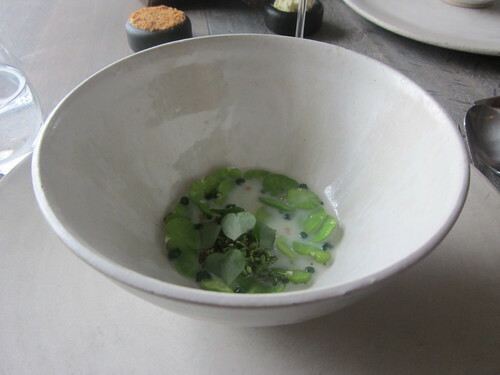 I truly could not say that any of these dishes were the greatest dish of the year, even if the meal was as impressive as any that I have had in many harvests. 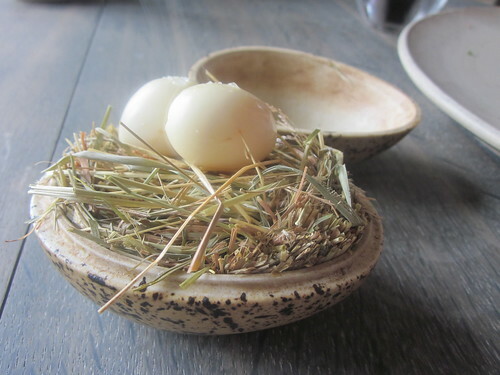 Like the food at Blaine Wetzel’s Willows Inn on Lummi Island (a modified gatherer’s cuisine, a step closer to traditional canons and two steps closer to farm-to-table dining), there is a sensibility: the recognition that the whole is more than the sum of its parts. Here was one of the greatest meals I have had which lacked a dish that I thought was among the greatest. And this is Noma’s triumph and its limitation. 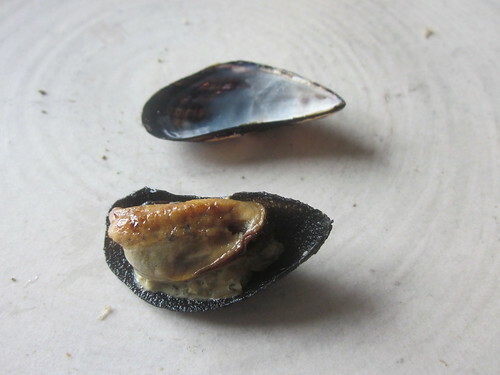 Rene Redzepi’s cuisine is so thoughtful, so engaged, so environmentally noble that it is in the experience of seeing the ground through the plate that one learns about the possibilities of dining. Our newest Spice House staff member, Justin Behlke, did a stage at Noma this past summer. He is new to town and tonight he is hosting his inaugural Chicago pop up dinner in our back yard garden. Sadly, I am out of town and can not experience this. I certainly understand what you mean about following in the footsteps of visionaries, visions are a pretty difficult and intangible craft to teach, and students have a huge failure potential. I can only say that I know this young man preparing his dinner with knowledge he acquired at Noma has worked on this dinner for months in an extremely dedicated manner. He has agonized over the menu almost as an author would work on a book, he has created, and recreated recipes, testing each incarnation. He has his vision of his dinner and his locally sourced ingredients follow suit. I presume his technique was learned through his experience cooking in some fine dining restaurants. I would like to post photos, if anyone is interested. I personally find it extremely interesting to see someone's work in motion at the beginning of what I suspect will become an extraordinary culinary career. 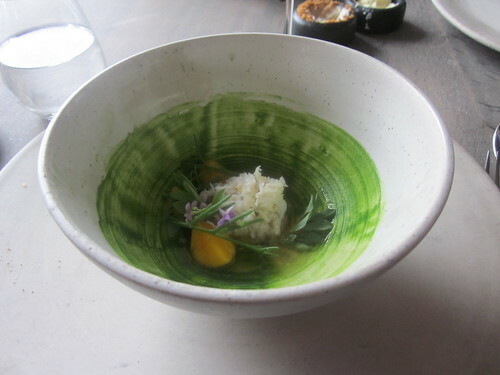 Make sure he posts about his dinners when he is ready to have the wider public present, and have him try Elizabeth Restaurant, where Iliana Regan is developing a New Gatherers' Cuisine. He has a beautiful night for dinner. Ya got ants, ya got a blender, ya got ant puree. The reason for the ants is that they taste like lemongrass (they really, really do - even the live ones which I tasted), and since lemongrass doesn't grow in Scandinavia, ants do the trick. Gary, this is simply incredible. 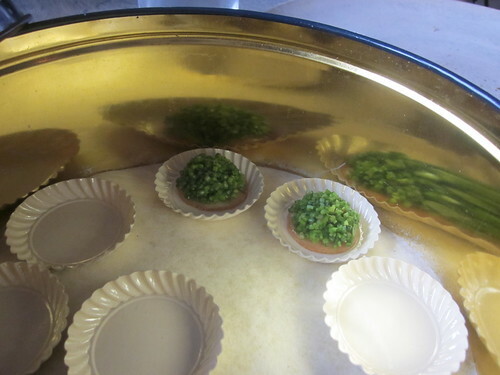 The pictures do convey the greenness of this cuisine, which you identify. A few questions, though. What is the long slab behind the potatoes? Also, "soil"? Thanks for posting the details. 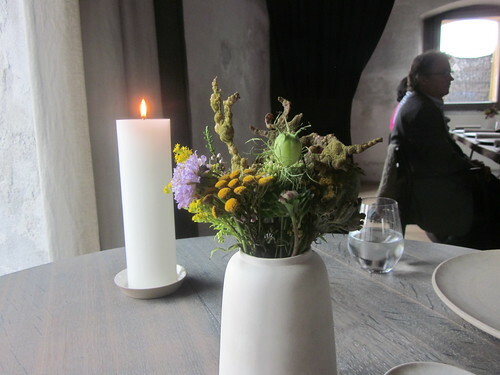 I've got no plans for Copenhagen on the horizon, but Lummi Island is a definite possibility. 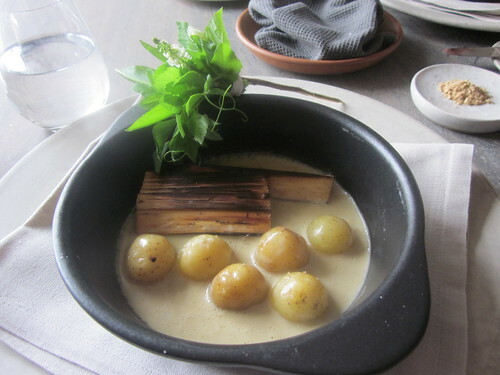 The slab behind the potatoes is burned wood to give aroma to the dish. I didn't note the type of wood. I always find it a problem to decide whether to think about the dish or to listen to the server. I try to do both, as best I can. The soil is a type of crumbs. 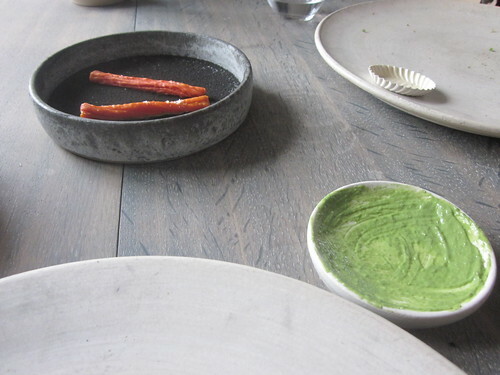 Noma varies what they use, often malt powder, hazelnut crumbs, black bread crumbs. I didn't write down what was the soil that night, but it varies. 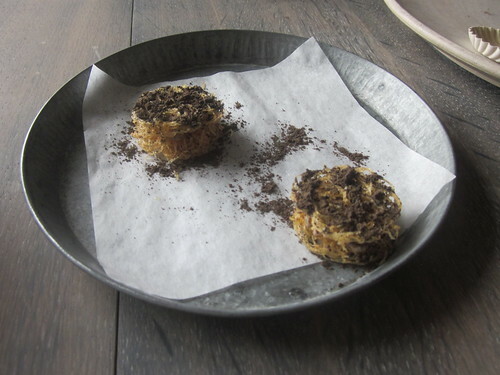 The crumbs are in an herbal emulsion. Definitely sail to Lummi Island (or take the car ferry). 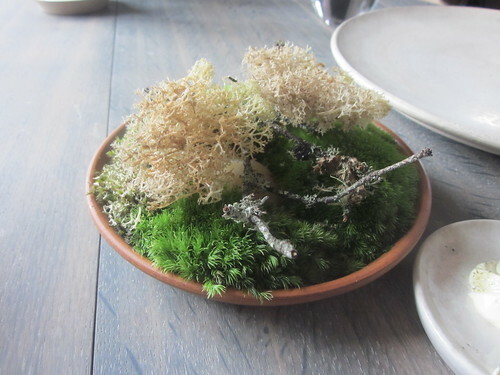 While not as elaborately orchestrated as Noma, Willows Inn is really superb and captures the Noma philosophy better than any other American restaurant. 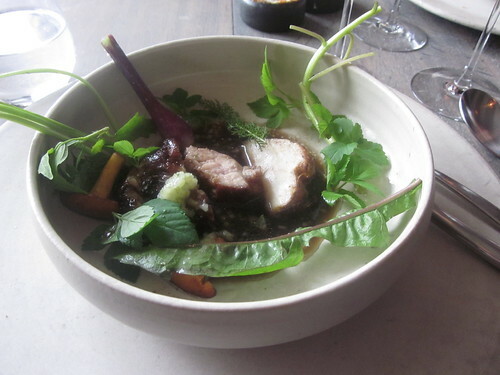 It is somewhat more farm-to-table than gathered cuisine, however. 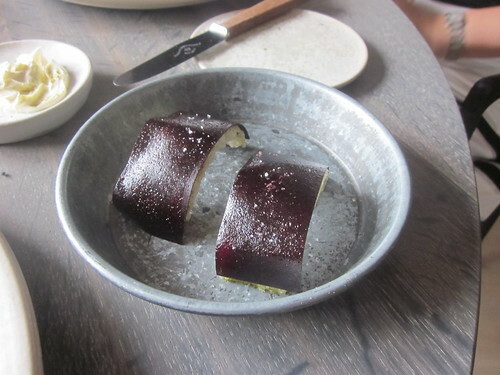 Elizabeth Restaurant is the American restaurant that is most committed to New Gatherer's Cuisine, but her visual aesthetic is slightly different, owing more to canons of modernist cuisine. Good news - Problems appear to be solved. The more I think about this, the more I think it probably speaks for itself. 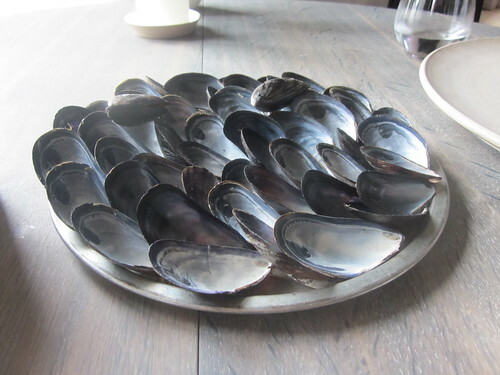 "And Rene Redzepi, chef of renowned Copenhagen restaurant Noma, famously blew up online when two tables no-showed and he tweeted a picture of him and his staff extending their middle fingers." I imagine that diners who could not get reservations for that day (and there will be many) will retweet Rene's gesture with sympathy.